Thanks to these new tests, the CUBE-S is of particular interest to internists, cardiologists, diabetologists and gynaecologists who want test results in a matter of minutes, not days. This instrument allows the physician to offer a patient an immediate diagnosis during a single visit and it facilitates the immediate and precise management of ongoing therapies. 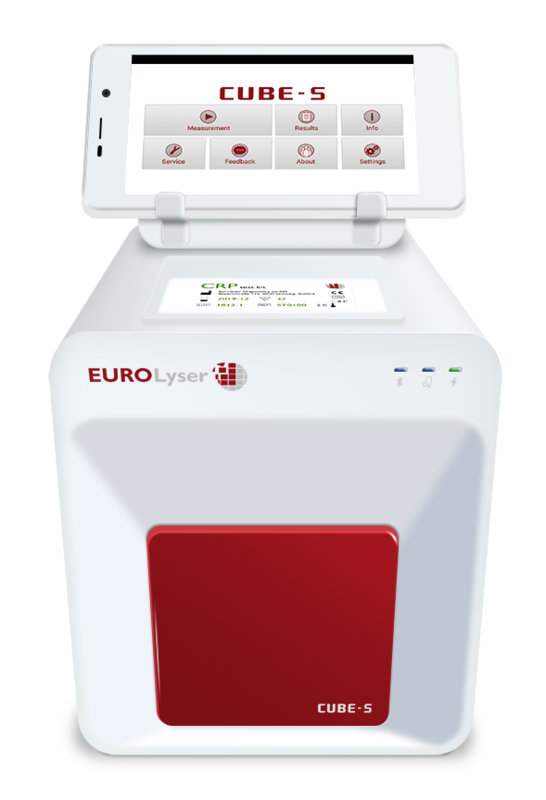 The CUBE-S is designed to automatically include a patient’s individual haematocrit values when calculating CRP (C-reactive protein) values – making the measurement results from whole blood even more accurate. What type of regular maintenance does the CUBE-S instrument require? The CUBE-S instrument has been designed to be maintenance-free – it does not require any regular maintenance. The instrument is calibrated at the factory and has an internal self-check procedure during every measurement to ensure that it is functioning properly. The calibration curve, the expiry date or the cut-off value for each test is encoded on the RFID card provided with each test kit. The CUBE-S has embedded software and new versions are released for free when new features (such as new user information, new tests, new languages) or functionality improvements are added. If you like to use the new features, all you need to do is updating the CUBE-S app. The procedure is just as simple as updating any app on an Android phone: go online and press “update”. If you intend to continue using the CUBE-S instrument as is and do not need new features, there is no need to update the software. New software updates are automatically pushed on to your CUBE-S tablet PC as soon as you are online (e.g. connected to a wireless network). Just follow the instructions on the display. The exterior of the instrument and tablet PC can be cleaned using a lint-free cloth dampened with water. A mild detergent may be used if necessary. No liquid should be allowed to run onto the edges of the display, the measurement well, or the connectors. Do not use organic solvents or corrosive substances. Spillages of potentially infectious material should be wiped off immediately with absorbent paper tissue and the contaminated areas swabbed with a standard disinfectant or 70% ethylalcohol. Materials used to clean spills, including gloves, should be disposed of as biohazardous waste. 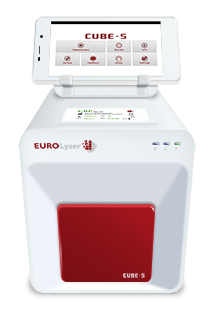 The CUBE-S, being a point-of-care system, uses single-use reagents. Therefore all Rilibäk requirements (Part B1 of the “Richtlinie der Bundesärztekammer”) are met. As a result, the instrument is exempt from the obligation to perform a round robin test and internal measurements are to be performed once a week.